However, I am not sure how credible these numbers are, and I was unable to find further information about general crime rates (most statistics seem to focus on a specific sort of crime). Are there any statistics that show that Mexico has one of the highest crime rates in the world? For overall crime, Mexico does not have the highest crime rate. For intentional homicide rate specifically, which may be what the claim is most concerned about, Mexico is number 23, according to UNODC data. 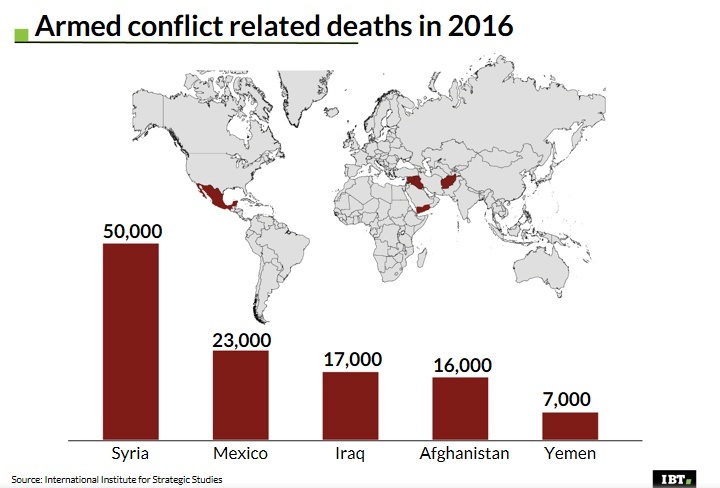 The migration push to the relative safety of the USA is not only coming from Mexico though, but also from other countries in Central America, with much higher homicide rates. In fact, the numbers 1 and 2 are just “behind” Mexico from a US perspective, and undocumented migrants from those Central American countries will enter through Mexico. Those homicide rates are in fact one of the main causes of the push for migration, which is in turn increased by mass deportations. So, yes, violent crime in Mexico is very high, but overall not as high as in El Salvador or Honduras. The OP probably does not mean to imply that a wall or deportations will reduce those crime rates, and it may in fact do the opposite. Whether a wall or deportations would have any effect on crime rates, either inside or outside the USA, is interesting and relevant but beyond the scope of this question. Not the answer you're looking for? Browse other questions tagged united-states criminology mexico .